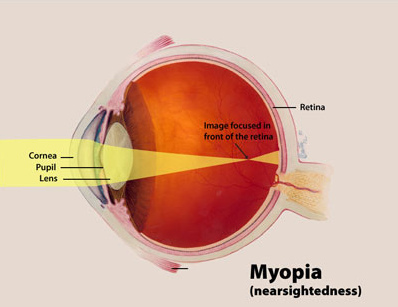 What is Short-Sightedness (or Myopia) ? Short-sightedness, or myopia, is a condition where the eyeball is too long, causing the image of distant objects to fall infront of the retina. The onset of myopia is usually in childhood or adolescence and this usually steadily worsens until the patient is somewhere in their 20s. Myopia is becoming a more common condition, and it is estimated that in Europe some 30% of children will become short-sighted. As short-sightedness gets worse, it leads not only to a requirement for thicker glasses or contact lenses, but to an increased risk of eye diseases such as glaucoma, retinal detachment and certain forms of macula degeneration. In the past, several methods have been tried to prevent the further lengthening of the eye and the associated increase in myopia. For example under-correcting myopia (prescribing weaker spectacles than are indicated), using bifocals for reading purposes and limiting the total amount of closework that is undertaken. However many of these methods have been shown to have no effect, or in some cases actually make things worse. Recent studies have concluded that a technique known as Ortho-Keratology can slow the rate at which the eye elongates, suggesting that the treatment can slow the progression of myopia to a certain extent. A three year study showed an average increase in myopia of just 0.13 Dioptres for children wearing Ortho-Keratology lenses, compared to an average increase of 1.03 Dioptres without. More importantly, they also concluded that wearing Ortho-Keratology lenses was comparable to soft contact lens wear in terms of efficacy and safety. In addition to the effects on the progression of myopia, children who are fitted with Ortho-Keratology lenses are able to spend the whole day lens free, so they can swim and play sports without any concern. Furthermore, as the lenses are only inserted and removed at home, there much less chance of lenses becoming lost or broken. Our page on Ortho Keratology lenses provides further information on this subject, or for a consultation please call our Banbury practice on 01295 262 501.